If you have poor eyesight, or are nostalgic about classic arcade video games, then the TableConnect is for you. 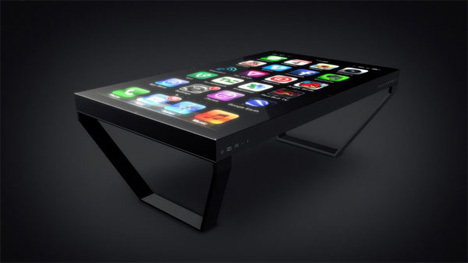 Simply plug your iOS device into it and it’s projected on a huge table. The orientation is like a cross between an air hockey table and an old bowling alley Pac Man game – the kind you look down on through a glass screen. The TableConnect, however, has a fully-functional touch screen and is just as responsive as your iPhone. The screens can be swiped, and every nuance of a normal sized iOS device is magnified to fit the five foot table. One of the more quirky results is that the pinch-enlarge feature becomes a full body stretch, using your hands and arms. See more in Phones & Mobile or under Gadgets. October, 2013.